Musings from Doha: NO MORE CARS PLEASE.... MAKE BOMBERS AND TANKS!................................. How US became the largest producer of warfare equipment from 19th position!! NO MORE CARS PLEASE.... MAKE BOMBERS AND TANKS!................................. How US became the largest producer of warfare equipment from 19th position!! It is estimated that US now accounts for 34% of all global arms sales amounting to more than US$100 billion.World's second largest exporter of weapons is Russia but US is 58% higher than those of Russia!When this news caught my attention, though it has a negative tinge of war and violence, I was curious how this happened.All these developed countries-barring a few like Japan-are making whopping revenue by doing this while developing countries like India remain largest importers!! From a position of 19th,US came up all the way during the second world war,a position US retained since then to this day.How could US, a democratic country attain it decades back relatively in a short span to counter the axis of two largest industrial and military giants of the world then - Germany and Japan is interesting to any person with a corporate background. 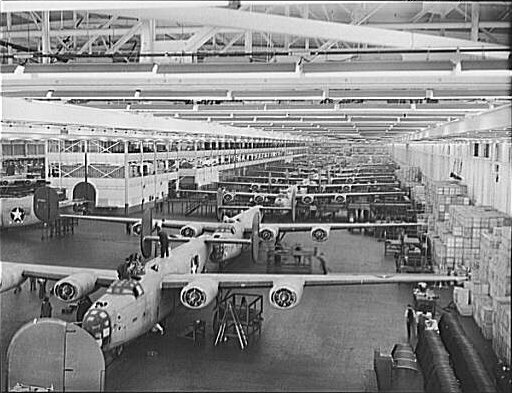 On 1 January 1942,three weeks after the attack of Pearl Harbour, by an unexpected,unusual Govt decree, American automobile manufactures were asked to stop production and sales of cars, trucks and even auto parts for an indefinite period commencing Feb of the same year.The order froze even delivery of cars to customers who had previously booked them!US automobile industry, producers of largest number of cars in the world- as high as 3 million in 1941- was transformed completely to turn out plane engines, tanks,bombers and guns within a short span of few weeks!! From 1942-45, for four years only 139 cars were manufactured in US, that too for the Govt purposes only!! Detroit, the automobile city turned overnight to take lead of another role- hub of 'arsenal of democracy'. Until attack on Pearl Harbor took place, Americans were in comfortable position thinking that the venues of actual war are far away places, in other continents.For the same and other reasons there were people who opposed US direct participation in the war-almost 50% of the population.But the shocking,unexpected and devastating attack on Pearl Harbor where 2400 US citizen were killed while 8 battleships and 200 planes destroyed made the change of the minds of the people instantly.United States became United Americans over night.US might have faced a worse situation thereafter only on 11 September 2001.US declared war on Japan, Germany and Italy within 24 hours. I think it is human nature to behave so collectively.Kerala, my home state had to face unprecedented flooding in August 2018.People of Kerala collectively faced it and came out of the debacle albeit now we are back to our favorite sport- mudslinging and petty politics. US entering into war had dramatic effect on life of the people.President Roosevelt had to take a lot of hard decisions with the full support of the American congress.Japanese Americans were identified and asked to report to authorities.Later they-including second generation Japs in US and their families- were sent to far off 'relocation centers' set up for the purpose which were nothing more than glorified isolated detention camps.But there was no such treatment for German Americans or Italian Americans!However it may not be fair on my side not to mention that in 1988 under President Ronald Reagan American congress formally apologized for its wartime treatment of these innocent Japanese Americans and paid some token compensation ! 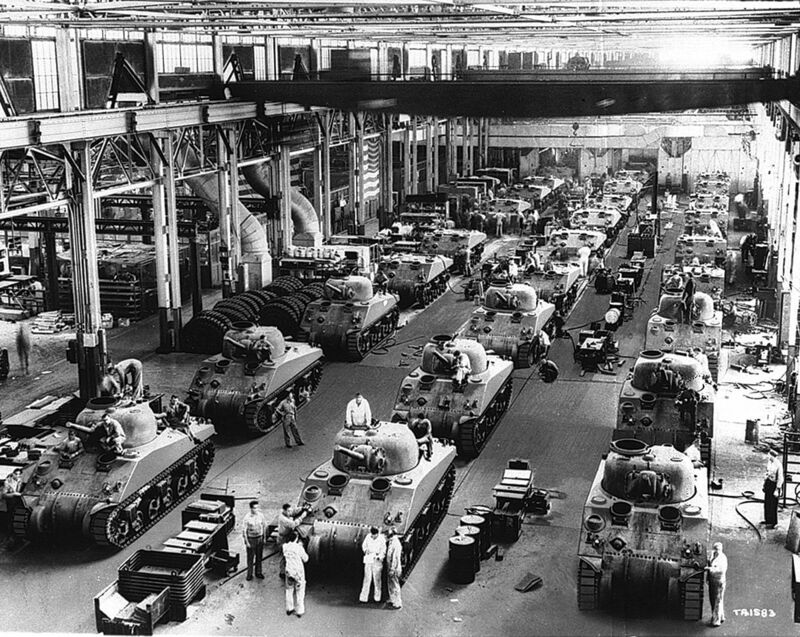 Rationing of food, petrol and diesel, clothing,rubber and few other products were introduced among the public.The automobile industry was ordered to change the production line. President Franklin D Roosevelt used a novel but an apt phrase of 'arsenal of democracy' to describe own country as he tried to arouse popular support for sending military aid to nations fighting Axis of powers.Detroit, the biggest car city started playing a pivotal role as all the auto factories started to churn out military warfare products. 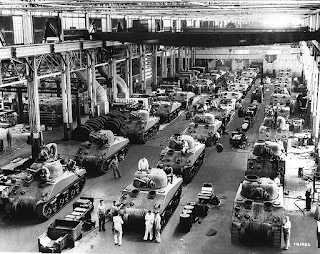 The result of such a vigorous move in production was unimaginable.US became the largest producer of warfare equipment in the world from the its standing of 19th in the world in 1939, a position which they hold to this day.